Part two analyzes the defense in the context of the Texas game with overall notes for the future ahead. But, first, there was a great game played against Kansas State and a “not-so-great” game played against Drake. It needs to be understood that, though there is criticism in both Part 1 and Part 2, it should be digested as a way to move to an even higher level of performance, not as a sign of negativity towards what was accomplished in 2018. 2018 has been another step forward and has redefined expectations for what is a very solidly good football team. *** I was very excited that the play on Saturday by the defense in no way disproved the points below…in fact it confirms much of the analysis. *** Kansas State used blocking angles created by an alignment advantage and a lack of discipline by the Iowa State defense to rev up their running game. Iowa State’s defensive staff was slow on the jump in countering with outside pressure in to the running lanes, but brought it in the fourth quarter just enough to allow the offense to continue to do what it was doing. *** The strip sack and catch by Mike Rose was a bit of luck, but an exceptional example of taking advantage of the opportunities that present themselves. Great catch, Kansas State did not even know what was happening until it was too late. *** Having big number 50 back in a prominent role in the second half was a major lift. It was good to see. The injury put a dent in what was otherwise a tremendously effective 2018 campaign. *** The offense ran the ball to the outside to an expected effect and continued to dial up the vertical passing game until Kansas State stopped it. Only, they never did. So, Iowa State kept going to it. That was fantastic and a solid building block for play calling development in 2019. *** Hakeem Butler is great, except when he has a routine catch to make. The drops and lack of focus on wide open catches is the next step in his development. Butler will receive a solid draft grade based on his potential and I would not blame him for leaving. However, the Kansas State game provided a perfect example of why another year of seasoning at Iowa State would solidify his draft stock and enhance his prospects to be an effective, long term NFL player. *** Saturday vs. Drake may have been David Montgomery’s last Big 12 game in Jack Trice. His consistency is absolutely remarkable. When healthy, and sometimes when not, his game in and game out performance level remains at a consistent level. His numbers might not have reached the level of greatness, but his play is a level above any other running back I have seen in the last two years. *** Against the Wildcats, Brock Purdy was more decisive and played within himself better than he had in any previous game. The ball was out of his hands quickly and decisively. He ran when necessary and preserved himself when doing so. His play was a result of corrections made after the Texas game and probably due to getting dinged up. Improvement after a tough performance is the sign of solid coaching and a willingness to learn by the player. This was a very good sign for the future. The conditions for the Drake game were certainly and equalizer, but both teams had the same the same conditions to deal with. Drake did a superior job in adjusting its scheme on offense and defense to deal with the conditions and the opponent. Not much else needs to be said about that game. The injuries stink, but most should heal. They opened up the opportunity for some younger players to show out, and a few of them did. The Iowa State defense has gained a significant amount of attention due to its outstanding performance over the last season and a half. Rightfully so. It is an innovative approach to dealing with high powered offenses with less than high powered talent. However, the talent present on the defensive unit in 2018 was perhaps at the highest level in Iowa State history. The unit had more speed from top to bottom than any we have ever seen. It boasted breakout players like Braxton Lewis and Greg Eisworth and established veterans like Brian Peavy and Willie Harvey. The glimpses of some of the young talent we were able to observe were promising and revealed that the ceiling should be higher in 2019. With the praise though comes competent attempts to solve the puzzle and take advantage of the weaknesses present in the scheme. Every defense has holes, regardless of structure. To make big plays, defenses will often leave an area or aspect of the game vulnerable in order to attack tendencies of a certain offense. West Virginia for instance. Iowa State took away the inside seam passing game and exposed the flats with the thought that West Virginia would not pivot effectively enough to make up the difference. They were right. Yet, there has been a way to put this defense in jeopardy since the beginning of the season. I have waited to discuss it until we saw it on the field. Texas was the team that exposed it and Kansas State, in their own less competent way, capitalized on the same motif. At Big 12 media days, I sat with my Cyclone Fanatic boss Chris Williams and others and used beer cans to demonstrate the threat to the Iowa State defense. Yet, outside of Akron, no team until Texas really game planned in the preferred and obvious method. You see…..that is exactly why the Iowa State scheme has been effective. Even with fairly obvious attack points, those points are not congruent with the offensive philosophy of most of the league. In addition, the league has not respected Iowa State in a way that would encourage them to go off script in order to defeat their offensive or defensive unit. The Iowa State scheme forces an offense to be patient. It forces them to grind. It forces teams to be physical and methodical in their approach. Big 12 coaches are not good at this. But, Texas is all about it. Kansas State is all about it. And, there is where you see the formula exposed. The league is shifting in its philosophy and play. It will shift further next year with Matt Wells taking over at Tech and Les Miles at Kansas. Therefore, the Iowa State defense will need to shift, fill some holes, pivot from some tendencies, and continue to make the in-game adjustments they have become known for. A defense is made of multiple pieces that must remain rigidly disciplined to its keys and assignments in order to exhibit its maximum effectiveness. Then, if individual matchups are dominated from the base structure, big plays happen in the form of sacks, tackles for loss, and turnovers. This concept can be described as the structural integrity of a defense. Rush Lanes/Edge Contain – The rush players, primarily the defensive line and linebackers, must maintain their rush lanes on the way to the ball. That means no players jump out of their lane on the way to the backfield which creates a gap in the integrity of the front. The interior players are taking a direct line back to the ball and disengaging to move laterally, parallel with the line of scrimmage. The ends or edge responsibility players take a controlled arc. It must be controlled because they must set the edge to contain players attempting to escape outside, yet not penetrate wildly to allow for a gap inside of them to emerge. That means you maintain outside leverage while pressing down and up field. Linebacker leverage and fill – The linebackers must fill their assigned gaps with force and shuck the block forthwith. Equally important is that they maintain the proper leverage. That means if they are an inside out player, they remain on the inside shoulder of the runner to force them outside and prevent a cutback which shatters the integrity of the defense. Or, if they are a force player, then they must maintain outside shoulder leverage in order to force the player back in to the pursuit. Each defender has a leverage assignment in any defensive scheme, however, the linebackers ability to maintain leverage and fill without remaining blocked is the spine of the structural integrity of a defensive scheme. Coverage discipline and recognition – In coverage, there is a zone to be covered. If a route extends beyond the zone, it must be turned over to the defender covering the next zone and any route then threatening your zone of responsibility must be picked up. It takes discipline, trust and route recognition (film study) to effectively execute solid zone coverage. In man coverage, a particular leverage – inside or outside- is assigned, and must be maintained to effectively take away the routes. Inside leverage is intended to cut off routes run to the inside of the field which is likely to be exposed. Outside leverage is designed to force the routes to the inside where there is more coverage traffic. Pursuit — pursuit, pursuit, pursuit. Rallying to the ball. A defense holds its structural integrity, then pursues to the football pursuant to its leverage assignment and the proper angle to make collective tackles. The most sure tackle is the one performed by three defenders rallying to the target. Pursuit must be drilled every day and it must be passionate and disciplined to be effective. A breakdown in the pursuit angle also creates an integrity break that allows a cut in to open space. The best defenses pursue and bring numbers to bear as soon as the target is located. Offensive play design is predicated on breaking down the structural integrity of the defense. Great play calls are often targeted at a known or emerging break in that structural integrity. To move the football effectively, a defense must bust or be schemed out of its assignments. It is imminently possible to break the integrity by simply physically dominating a point of attack. On offense, that manifests in offensive line push. On defense we will see disruptive plays in the back field. While this is a simple look in to defensive philosophy, it is the underpinning of how effective defense is played. Iowa State has been remarkably disciplined in its use of the 3-5-3 defensive scheme. That is why teams tend to bog down against it. Eventually, the defensive discipline outpaces the offensive patience and the structural integrity of the defense takes over. The caveat is that there are ways to challenge that discipline and every defense has a disadvantage in covering the entire field. The Iowa State defense becomes vulnerable to big plays and grinding drives if there are break downs at the line of scrimmage. It requires stellar line play and on target play from the middle linebacker. In the secondary, it requires the safeties to have outstanding route recognition and to maintain the zone coverage and help aspects of the coverage called. Texas, in particular, broke down the Iowa State defense. They did so in a number of expected ways, and some unexpected ways. Let’s look at some film and opine about what needs to be shored up in the off season in order to remain a top defensive unit in 2019. At the bar in the summer, I described the all important use of a fifth receiving threat to defeat and frustrate the Iowa State defensive scheme. With the max coverage zone look, there is not an underneath defender. Therefore, a delayed route from a tight end, a running back, or a slot receiver is going to be open and effective. However, that is not a preferred or oft used element of most of the Big 12 offenses. Now, get a little creative with it. Run crossing routes (Oklahoma and Akron) throughout the route tree and you have created a threat to the structural integrity of the zone by moving it and creating space. Watch above as Texas sends five out in routes. They are running wide wheels, deep dig, and cross drags. Iowa State spies the QB with the MLB and delay rushes him on a drop. This clears out the middle of the coverage. The target then becomes the fifth man in the route underneath who is wide open. Iowa State has a man look here as 6 is trying to chase the target receiver. Against a man call, the same route tree is just as effective as it essentially picks the chasers off. Texas breaks down the coverage with their crossing routes and Iowa State’s coverage is washed out of their coverage leaving significant space for an easy throw to a wide open receiver. The fifth man is unaccounted for. Be it zone or man, a primary route tree that shifts the coverage with a fifth target providing counter motion will be uncovered. It is solid play design to incorporate this type of scheme and every defense struggles to account for it. However, making it a primary point of attack has not been a priority against Iowa State until the Texas game. With the lid off this play design’s effectiveness, Iowa State will have to pivot in 2019 to counter the use of the fifth man and the underneath cross. I believe the pivot involves pressure consistently brought from the outside at different angles. We will see that a bit later, but it is a problem that must be addressed going forward for the Iowa State defense. Focusing on the defensive end at the top of the screen and on number 2 in pursuit we see a breakdown in structural integrity that was costly and common against both Texas and Kansas State. The defensive end must maintain his lane discipline by fighting the down block and maintaining position on the edge in order to contain the runner and force a directional decision in the backfield. Here, the defensive end is too high and dives to the inside with the block leaving a massive weakness and allowing the runner to make a directional decision at the second level with space. Harvey is pursuing with vigor from the back side. He is to target the runner and maintain inside out leverage in order to cut off a cut back. His angle is solid, but he flies past and over pursues the play allowing for an easy cut back and first down yardage. This play illustrates the devastating effect of a breakdown in structural integrity. There is nothing wrong with the play called, but the execution lacks and a big play results. A hold on the end re-routes the pulling lineman, creates hesitation from the runner, and allows the linebacker fill to further frustrate the play. We have consistently seen that from Iowa State, but it became a persistent issue against Texas and Kansas State. Iowa State aligns its ends inside in many of their looks. This creates an alignment angle to the edge and puts added pressure on the defensive end to maintain his lane integrity. However, it is a key component to the effectiveness of the defense. As new players are infused in to the lineup, their ability to maintain disciplined lane integrity will determine the continued effectiveness of the unit. Pursuit has been a strength of the Iowa State defense in 2018. It must be improved in 2019. Over pursuit like what was seen against Texas opens large patches of open space and can not be tolerated. The line integrity is enhanced with pressure off of the edge. Iowa State can bring that pressure from the outside linebackers, the star, a deep safety, or a corner. We have seen all of them utilized in 2018. Against Texas, the defense was effective when Harvey brought pressure off of the slot and filled that outside rush responsibility. Bailey was loose in his lane discipline and is here too, but he gets there by beating his man and collapsing in. The middle stunt is run within the proper lanes and you get a camp meeting at the quarterback on a big third down play. This is one of many fixes for the struggles indicated above and which played out in the late 2nd and 4th quarter against Kansas State. The package works because there is a quick pick up in the secondary. This gives the time for a proper angle to be taken and to narrow the vision and passing lanes available to the quarterback. The stunt takes advantage of the limited skill set on the edge and the fairly prodigious pass rush talent of Jamahl Johnson. Now, there is the possibility of bringing pressure in to the same target zone with different players from different angles on the field. This is a challenge to address for the offense and will cause them to take a series or two to adjust. It is my expectation that the 2019 version of the Iowa State defense will involve a significant and timely amount of additional pressure from the fourth rush lane. Presented here is the second way to effectively attack the Iowa State defense. Line up, fire off the ball, and physically smash away at the middle of the defense. Few Big 12 offenses use Big 10 offensive concepts. But, Iowa does every year. In addition to the fifth man, stopping the power run game is a weakness of the Iowa State defense. The defense is built to run and cover space while attacking pulling lineman and misdirection. It is not a straight forward attacking defense. Therefore, when presented with a power blocking scheme there is the possibility of being physically overmatched. At this early point in the ball game, Iowa State has already been beaten physically enough that they are now catching blockers instead of striking and shucking them. This is the death knell for linebackers and the secondary as they give ground, get shielded, and cannot get off the blocks. We saw Kansas State lean primarily on this weakness in its attack. The base blocking and down blocks put Iowa State in retreat mode and exploited their design by physically engaging the defense. Texas is a power team. A patient, power team. They only run read option, stick routes, and deep verticals. That is all they did against Iowa State. But, the patient power game took a toll and changed the ordinary attack of the players on the defense. This is truly a mental adjustment and a mental game. It is one of the reasons Iowa State has struggled in the Iowa game. Early season physicality is hard to coach if it is not the primary focus of the scheme. Iowa State struggles against Iowa and will continue to struggle against Texas and Kansas State for the same reason. It is difficult to play in a finesse mode against OSU, Tech, and West Virginia, then flip the switch to play a power forward offense. Difficult, but not impossible. In 2019, Iowa State will need to develop quickly in its attack against these type of teams. 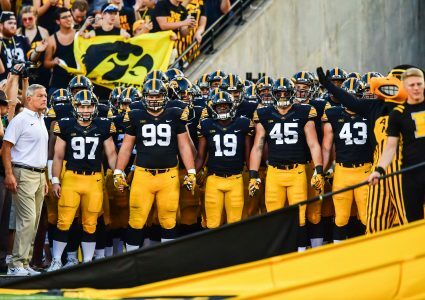 They will need to have an answer for Iowa that they can build upon in the Big 12 season. The answer is mental preparation. A final note, the near side defensive end loses his lane integrity and creates difficulty for the fill players to get to the tackle. The structural integrity was compromised at the line which caused a problem with the balance of the defenders in getting to their strike points. The outside pressure is utilized on this play. The pressure causes an early decision and focuses the target for the fill defenders. The end is slanting and he gets blocked soundly, but the support safety squeezes down his angle and maintains his force leverage on the outside shoulder. It is so vitally important to create a cut decision in the backfield. It focuses the pursuit and leaves few cut options for the ball carrier. It is the most vital point of run defense in my opinion. That is accomplished via the outside rush pressure on this particular play. If the fill player dives too far inside, then the back will chair cut in to wide open space. If the fill player stays too far outside, then the back will have a nice seam to explode to the third level. The integrity point is that he squeezes the force with outside shoulder leverage and makes the hit. When the scheme, or any scheme, is run with discipline in its assignments, then it has a chance to be successful. This is a strength of the Iowa State players and scheme and it will need to continue to improve in 2019. More teams will begin to attack Iowa State with the read option and base blocking schemes. Disciplined fill with aggressive pursuit will be required. Outside pressure is brought and picked up. Texas attacks the bothersome pressure by throwing in to it with the fifth man who is unaccounted for. Again we see the crossing routes move the zone defenders out of position and a throw to the fifth man using counter motion which eliminates recovery. The safeties have poor play recognition in that they are all influenced inside on the crossing routes. No attention is paid to the short motion to the flat leaving it completely uncovered and only one singled up corner on the edge to try to make a play. Both safeties, 33 and 1 are focused on double teaming in the middle and neither checks and flies to the flat. They have to check and fly to the flat when they know they are giving up a flat defender on the blitz. Even a blitz package has a structural integrity. The coverage has to roll to compensate or rally to a weak point. It isn’t easy, yards will be given up against the play call, but an untouched touchdown catch is not acceptable when half the field is left uncovered. The coverage breakdown was typical for the 2016 team and appeared with the safeties on the 2017 team. 2018 has shown marked improvement in this area. However, against Texas and again against Kansas State, there were problems in recognition and discipline that left chunk yardage on the field. In 2019, the returning safeties will need to make strides in recognition. A greater devotion to pressure packages will be required to counter league wide adjustments and the safeties will have to be on point to cover when that pressure is stunted. Texas scores its longest run of the season on this play. This is the replay. Not much analysis is needed on this one in light of the above. Bailey jumps inside and vacates his rush lane. This action confuses the fill and gives blocking angles at the second level. The result is a free run up the middle. If Bailey maintains his position and squeezes down, then play is slowed and the fill gets there to stop it for a reasonable gain. Texas forced this type of gamble by gashing and physically winning the match-up. The player then takes an undisciplined risk to try to make a play and therefore breaks the structural integrity of the defense. An ad lib in the initial engagement causes big plays to happen. It is something that rarely works, but is repeated often when a defense is struggling. It becomes a compounding problem as the rest of the defense does not know what adjustments they will need to make in light of the additional exposure. Iowa State has done a marvelous job of eliminating this type of play. It improved the defense and is the key to forcing offenses to be patient. As stated, Texas is patient. They will hit at you with their strengths until there is a break down which affords them a dagger play. Iowa State’s offense is geared the same way with a slightly less effective approach due to its line play. In 2019, particularly against Iowa, Texas, Kansas State, and Baylor, Iowa State must improve that discipline. Discipline and mental toughness in the face of physical pressure must become the norm instead of an adjustment for a few games. I love this. Seven players in a tight stack against a power spread set. Six of them come with the safety providing the speed rush from the outside. Make no mistake, Iowa State’s defense is fast and it will get faster in 2019. This was a hot read all the way, but the quarterback is confused and the pressure beats the blocking scheme, which is designed to influence the coverage. Iowa State meets this power look by getting off the ball better than they did most of the night and they strike and disengage due to the timing advantage. This represents an improvement that can be made by the staff and the players. We see the results of a unit prepared mentally for a power play and overwhelming force is brought to bear on a weak spot in the offensive scheme. 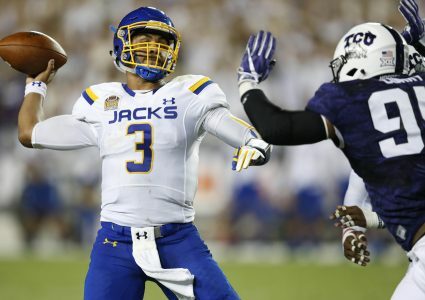 Getting off the ball, attacking with speed, and targeting option mesh points is a successful way to attack a team like Texas and Kansas State. 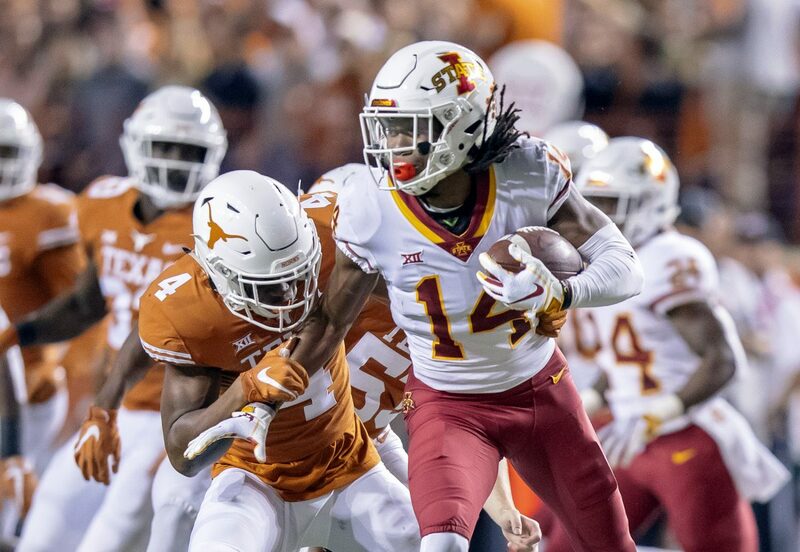 If Iowa State can ratchet up its mental preparation and dial in to a power mindset when required, then 2019 can be a better year defensively. Iowa State lost four games in the 2018 regular season. 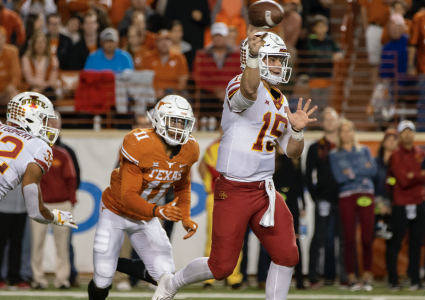 Those four losses had similarities in the style of play of the opponent and in Iowa State’s approach to those games on both sides of the ball. Iowa State is poised to maintain their second tier position in the Big 12 and should be expected to make a push for first tier status. That is how far the program has come and that is where the program is positioned. That said, it is far from a finished product both in the coaches offices and on the field. This is a defensive football team. They often play offense in a defensive mind set and the best talent on the team resides on the defensive side of the ball. They have schemed their way in to a top level Big 12 defense and will now reap the rewards of talent upgrades plugging in to the scheme. Iowa State must continue to evolve on both sides of the ball as they will be copied and the weaknesses addressed in these two articles will be exploited by much better football minds than me. The most encouraging part of the analysis is that all the tools are already there. It is simply the implementation and commitment to those tools that stands in the way of a 10 win season. Based on the progress of the program throughout 2018, 10 wins is achievable. It takes luck, good health, outstanding preparation, and talent development, but each of those elements are present. Can that be derailed? Yes. But, make no mistake, the cupboard is far from bare here and the upward trajectory can be expected to be maintained. Prentenders – no. Contenders – not quite, but it is on the horizon. Improve the offensive line and maintain that defensive line (games are truly won in the trenches) and 2019 will add December excitement to the November excitement of 2018. A graduate of Parkersburg High School, Iowa State University, and SMU Dedman School of Law. I am a practicing attorney and business consultant in the morning and an armchair quarterback in the afternoon. I played at Iowa State under Jim Walden. Turned a football obsessed hobby in to writing beginning with a stint at Wide Right and Natty Lite during the 2015 season. I am currently the Film Room writer and contributor at landgrantguantlet.com, will be a co-host on Big 12 recruiting podcast, The OV, and am an analyst here at Cylcone Fanatic.